Location: Léotoing, in the Haute-Loire departement of France (Aquitaine Region). 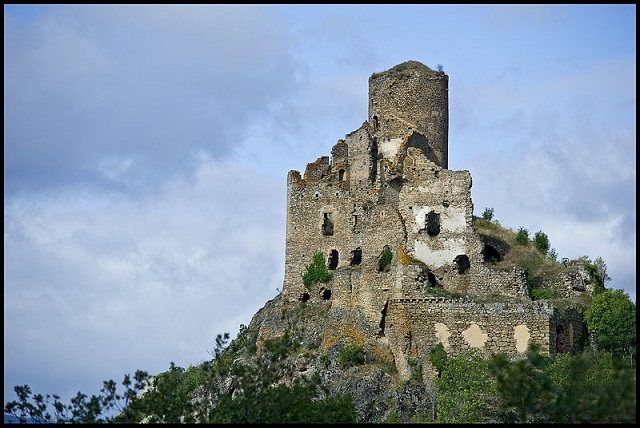 Notes: The castle of Léotoing is a castle built in the xiiie century located in Léotoing in the department of Haute-Loire in France. It has been registered for historic monuments since 7 July 1992.The name and the lordship of Leotoing derive their origins from a younger branch of the family of Mercœur. From the end of the eleventh century, Anthony of "Lauthon" and his brothers and his heirs imposed their authority on many neighboring fiefs. Around 1420, the seigneury split and the cadets settled in Montgon which becomes the main fief of the branch of the Léotoing-Montgon. The castle occupies only one mound delimited by a ditch, located approximately at the lowest point of the site, in the vicinity of the cemetery. As a result of dissension within the Auvergne family, Léotoing was one of the fiefs given by royal judgment to Robert Dauphin, Earl of Clermont, who bequeathed them to his son Hugues at the beginning of the fourteenth century.